Cut squash into thick slices. Sprinkle with spices of your choice. (I used a mix of Herbes de Provence, dried chipotle chilli, salt and pepper.) Sprinkle with flour. Heat olive oil in cast iron pan and cook squash until nicely browned on both sides. While squash cooks, cut ends off red onion and cut in half. Cook in a smaller cast iron pan, turning a few times, until almost blackened on cut sides. Cook haloumi slices in a little olive oil til browned. Chop cherry toms, fruit salad plant fruit and jalapeño. Mix in bowl together with mirin, white wine vinegar, dried mint, salt and pepper. Toss. Mix yoghurt with dried mint and a pinch of salt. Toss roast pine nuts on top and drizzle with olive oil. Sprinkle with pul biber (Turkish red pepper). Just before serving reheat squash slices and onion. 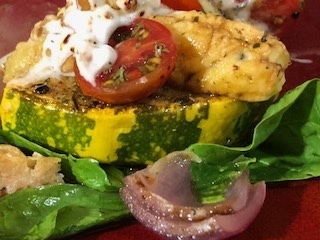 Place squash on bed of baby spinach, add halloumi and red onion and top with salsa. Drizzle with pomegranate concentrate. Serve with yoghurt and crisp sour dough bread to mop it all up. We eat with our eyes. 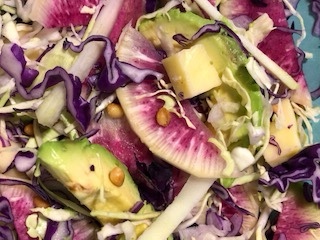 This colourful salad has purple & green cabbage, psychedelic watermelon radish & kohlrabi. To balance all this crunch there is mozzarella cheese, avocado and a creamy, slightly sweet & peppery dressing. Roasted pine nuts round it off. 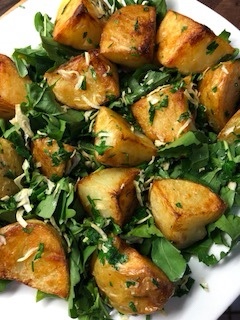 Roast potatoes with sundried onion slivers, chopped parsley and a sprinkle of salt, on a bed of rocket with a squeeze of lemon. I have a pocket of Rex Union oranges. 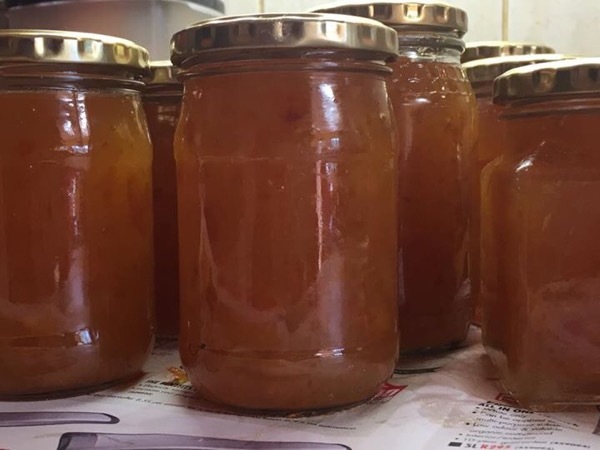 Their claim to be “the World’s Best for Marmalade” is no hollow boast. 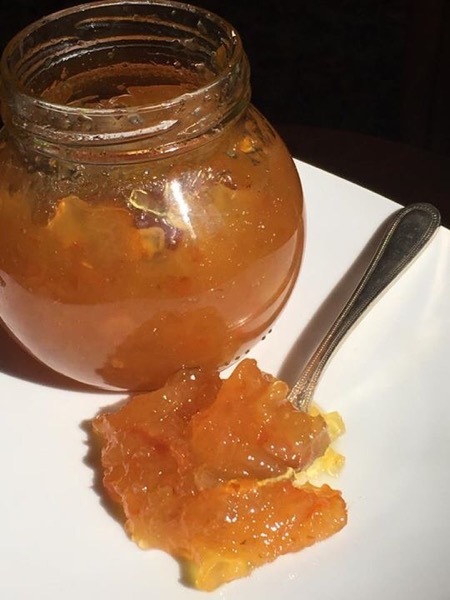 They make the most delicious tangy marmalade. You can read more about their history here. I have recently heard that the new owner is looking after the trees and hopefully they won’t die out. 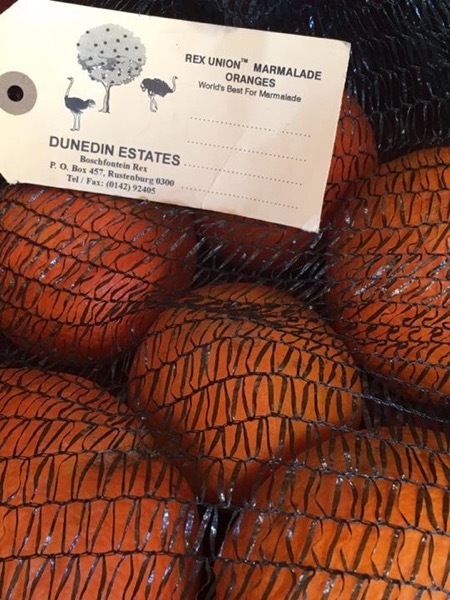 Rex Union oranges are available from Cheese Gourmet. * Put 6 whole washed oranges in a pressure cooker and add water to half cover. * When cool enough to handle, cut oranges into segments, remove any pips and thick pith. Slice finely. * Mix chopped oranges and the cooking water together. Measure how many cups there are and measure equal number of cups of sugar. * Mix together in a large pot. Stir over low heat until sugar is dissolved. * Increase heat to high and boil quickly, stirring often, until it reaches the wrinkle stage. * Spoon into sterilised bottles and seal. 6 oranges makes approximately 12 X 250 ml bottles. The watermelon radish has to be one of the most striking vegetables I have ever seen. 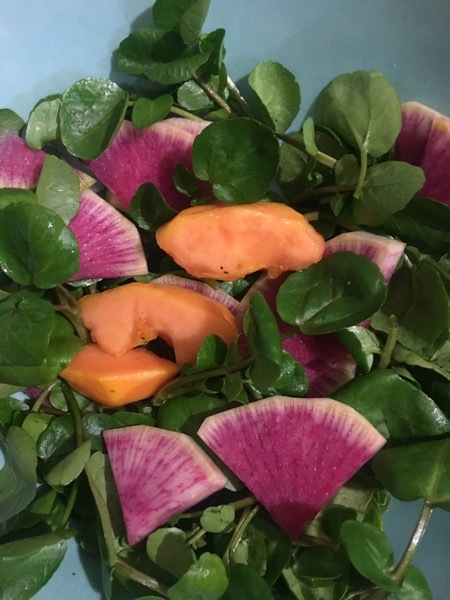 Tonight I made a salad of watercress, sliced watermelon radish and papaya. I served it with thin slices of ribeye steak drizzled with a dressing of olive oil, lemon juice, roast cumin seeds, five spice powder, sugar, salt and pepper. Watermelon radish are an heirloom variety of daikon radish. They are as easy to grow as normal radishes, but take a bit longer to mature. They are super crisp with a mild peppery sweet flavour. Salmon, watercress, avocado and nasturtium. The wetland pool is overflowing with watercress. A perfect peppery green for cold weather. 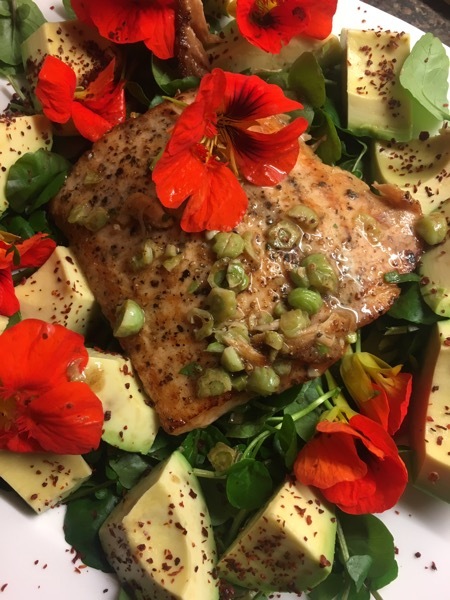 Tonight’s meal: pan fried salmon with lemon and garlic butter on a bed of watercress with avocado and nasturtium flowers and seeds. Served with roast baby potatoes and steamed beans and pattypans. Season a salmon fillet with pepper and salt. Set aside. Place watercress on a plate. Add butter to pan and cook the salmon on both sides until just browned but still pink inside. Remove from pan and place on watercress. Add a little more butter to the pan and add sliced nasturtium seeds and a sprinkle of garlic powder. Stir through over heat for about 30 seconds. Add juice from a lime, stir through and pour over salmon. Add nasturtium flowers and serve with the potatoes and vegetables. 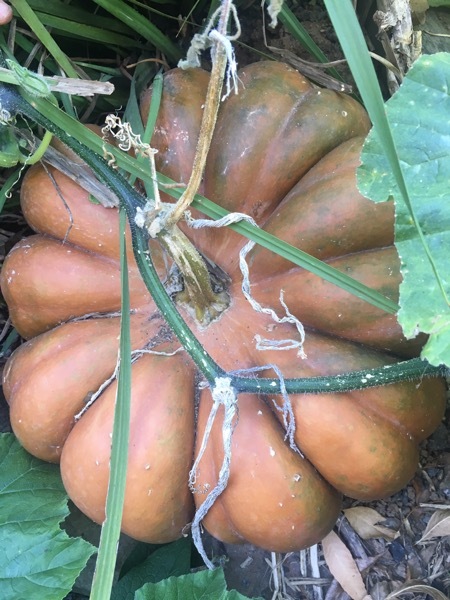 I was given this very beautiful French pumpkin by Cliff Rosen of the Let It Grow Foundation. 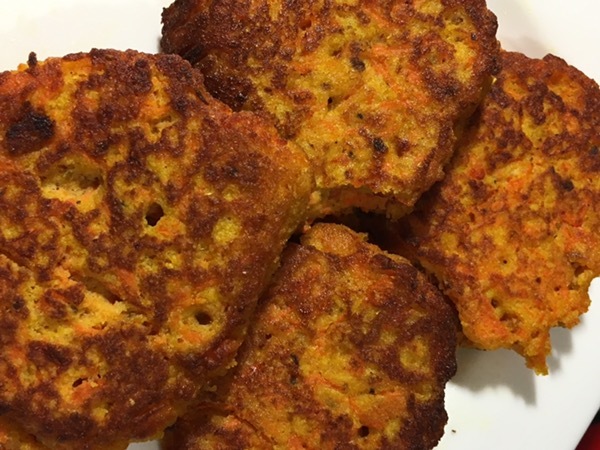 Tonight I made spicy pumpkin fritters served with a vegetable coconut curry and black rice. Most yum yum. Whisk all the dry ingredients together. Mash the pumpkin and mix with beaten eggs. Add to the dry ingredients and mix together. Add spoonfuls to hot oil. Cook on one side til golden, turn and repeat. Drain on paper towel. Serve with chutney. Perfect for a chilly autumn night, this is a delicious balance of meaty beans, flavourful chorizo and sweet potatoes. Toss the sweet potatoes with olive oil and some of the pul biber and roast at 200° until tender. Add the onion and cook, stirring, until onion is soft. Add garlic and cumin. Cook for few minutes more. Add the beans and stir through. Add beer and bring to the boil, reduce heat and simmer til beer is almost dissolved. Add tomatoes, stir through and simmer til slightly softened. Sprinkle the sweet potato with a little more pul biber. Add the sweet potato to the bean mix and stir through. Place a good handful of the chopped greens in the bottom of each bowl. 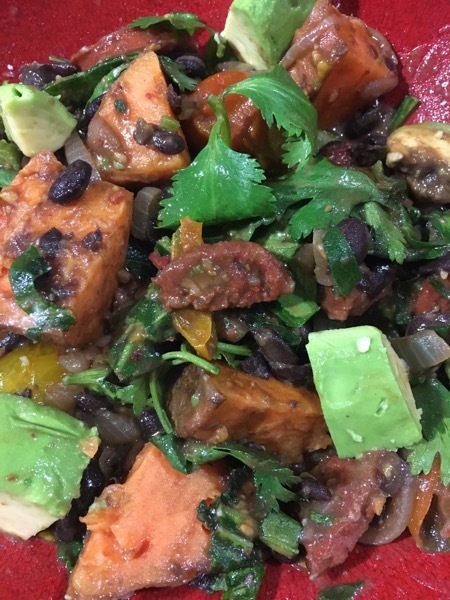 Top with spoonfuls of the sweet potato and bean mixture. Top with coriander and serve with warm cornbread and chunks of avocado. Because I made corn bread I made this to go with it. Most delicious and perfect for a cold night. Mix the first six ingredients together in a bag. Add the chicken pieces and toss to coat. Heat olive oil in cast iron casserole and cook the chicken until browned on all sides. Remove from heat and set aside. Add onions and bacon to pan and cook until onions are soft and golden. Add garlic and cook for a few minutes more. Add the rice and cook, stirring, for about 2 minutes. Add the chicken stock, tomatoes, tomato paste, water and sugar. Stir through and add salt to taste. Bring to the boil. 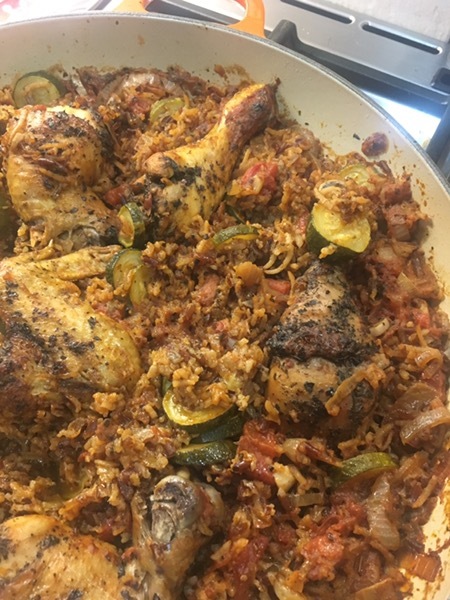 Nestle chicken pieces into the rice, cover and reduce heat to low. Simmer for 25 minutes. Uncover and fluff rice with a fork. Add courgettes and stir through the rice. Cover and place in oven at 150° C for half an hour. Serve with corn bread, sliced mustard and rocket leaves, slices of avocado and coriander leaves. Cornbread with farm yellow mielie meal. I discovered a bag of yellow mielie meal in the back of my freezer a few days ago. My Mom gave it to me – she had bought it from a Midlands farmer. I grew up eating yellow mielie meal porridge for breakfast and it was one of Mom’s comfort foods. But when I found the bag I thought I’d try making mielie bread with it – another of my Mom’s favourite things. It worked out perfectly – delicious flavour with a great texture. ½ cup chopped hot pickled jalapeños. In another bowl, beat the eggs until smooth. Add the buttermilk, melted butter and chillies. Mix together well. Add wet ingredients to dry and stir until smooth. 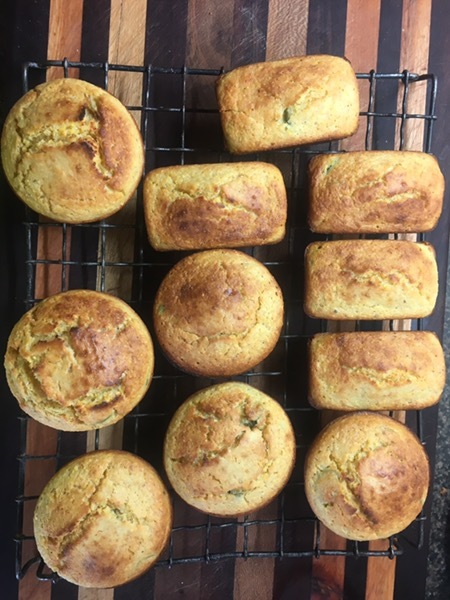 Pour into buttered mini loaf or muffin pan and cook at 200° C for 20 – 25 minutes, until browned and a wooden stick poked into the middle comes out clean. Turn onto wire rack to cool (although they are also really yummy warm).